This magazine article explores the research concerning the history of the Pantin paperweight factory near Paris. This research was first reported at the Paperweight Collectors Association meeting in Sturbridge Village, Massachusetts in June, 1965. Founded in 1850, the Pantin factory exhibited paperweights at the Paris Universal Exposition in 1878. 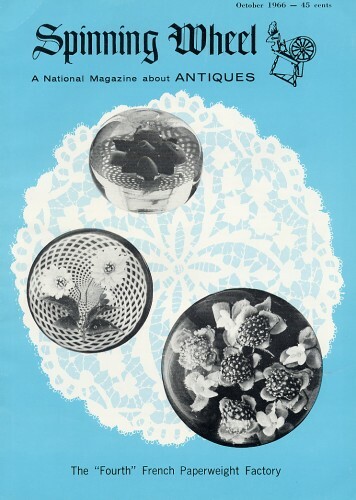 Note: Surprisingly the cover depicts three paperweights not related to the article. They are identified on the contents page. 8" by 11" format. The article is 2 1/2 pages long with five black and white photographs. New copy with appropriate aging. Click on the picture to a larger picture of the cover.